Small automatic drinking water pump. This electric water pump dispenser is the best replacement for your home-use top load dispenser, very practical and convenient. One key operation, easy to use. Automatic pumping and one key operation, just press the switch and the water will automatically flow out. Safe and reliable quality, with food grade silicone inlet tube and 304 stainless steel outlet pipe, environmentally friendly, odorless and non-toxic. Practical and convenient, the best replacement for your home-use top load dispenser, super labor-saving than manual water dispenser. ABS material sturdy enough and good for long time using. 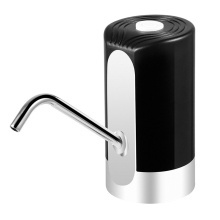 Easy to install and use, suitable for most water bottles(4.5L/5L/7.5L/10L/11.3L/15L/18.9L) with threaded neck. Low noise working without disturbing your sleep, work or study. Built-in rechargeable lithium battery, easy to be charged through connecting most USB powers. Compact and portable size, easy to carry it to anywhere you want. A perfect gift for your family, friends, colleagues, etc. 4. Press the switch and the water will automatically flow out.